Be the first to share your favorite memory, photo or story of Edmond. This memorial page is dedicated for family, friends and future generations to celebrate the life of their loved one. Mr. Edmond Ray “Wendy” Welborn, age 79 of Wilkesboro, died Friday, April 5, 2019 at SECU Hospice Care Center of Yadkin. Funeral services will be held 2:00 PM Tuesday, April 9, 2019 at Edgewood Baptist Church with Rev. Eddie Tharpe and Rev. Sherrill Wellborn officiating. Burial will be in the church cemetery. 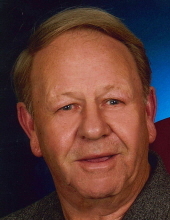 The family will receive friends Monday evening from 6:00 until 8:00 PM at Reins-Sturdivant Funeral Home. Mr. Welborn was born January 23, 1940 in Wilkes County to Ed and Nell Church Welborn. He was a member of Lewis Fork Baptist Church. He loved spending time with family, a good cookout and talking about old cars and the good old days, and a good golf game. His greatest joy was helping people; going out of his way to help others. He was preceded in death by his parents; one sister, Christine Cooper; and one brother, Glenn Welborn. He is survived by his wife, Brenda Anderson Welborn, of the home; one daughter, Kimberly Hayes and husband, Ken, of Wilkesboro; four sons, Josh Welborn of Wilkesboro, Junior Welborn and wife, Annette, of Purlear, Mickey Welborn and wife, Sharon, of McGrady, and Mike Welborn and wife, Delores, of Moravian Falls; nine grandchildren; and one brother, Bryant Welborn and wife, JoAnn, of Purlear; and a special nephew, Thad Anderson. Flowers will be accepted or memorials made to SECU Hospice Care Center of Yadkin, 243 North Lee Street, Yadkinville NC 27055. The family would like to give a special thanks to the staff of SECU Hospice Care Center of Yadkin in Yadkinville. To send flowers or a remembrance gift to the family of Edmond Ray Welborn, please visit our Tribute Store. "Email Address" would like to share the life celebration of Edmond Ray Welborn. Click on the "link" to go to share a favorite memory or leave a condolence message for the family.